Children love to play outside and the Little Tikes playhouse is the perfect occasion for them to engage in various outdoor activities and to develop their building and imaginary skills, without any risks for injuries. Playhouses in general are a great way for children to interact with each other and spend quality time outside. When playing, the children are stimulated to imagine various scenarios and themes, essential for their intellectual growth, while they can also develop their logical skills by putting the house together and decorating it as they please. A Little Tikes playhouse offers you the possibility to bond with your child while building it, due to the compelling design that the children find very attractive and that often ends up representing their own small universe, where they can exercise different talents and be physically active, which is essential for a healthy body and mind. The Little Tikes playhouses come in different models and offer numerous playing ideas, while being completely safe for your child. The Home and Garden Playhouse has an open design that I love because of its many areas where the children can play games. The house has a working door, a mailbox and a fence so your children will feel comfortable in an environment similar to the one in your own home. It comes with a small kitchenette, where the kids can exercise their cooking skills at the realistic pretend stove with clicker knobs. The little boys will have a blast playing with the hammer and the screwdrivers on the pounding bench, while the little girls can plant flowers and watch them grow over time. This Little Tikes playhouse is approximately 80 inches long, 36 wide and 52 high, being spacious enough to accommodate two children. However, other children can play in its outside area as well, due its friendly open design. Little Tikes Endless Adventures PlayhouseThe Endless Adventures Tikes Town Playhouse is a model that includes four different themed walls, so your little ones can imagine that they are firemen in the Firehouse, they can learn and write the alphabet in the Schoolhouse, play one of the 6 included sports games in the Sports house or sell groceries in the Grocery Store. So, I can honestly say that your little ones will never get bored with this great playhouse. It is suitable for children between the ages of 1 and 6 and it can hold up to 3 kids at the same time. A sense of belonging and security offered by the miniature house in comparison to large and busy playgrounds. Apart from not being functional during the cold season and not being suitable for indoor play, the playhouses offered by Little Tikes lack disadvantages. They are made from plastic and not too heavy, so they present no dangers whatsoever. Also, putting them together is very easy and actually quite fun when the family works together. If you are searching for a way to stimulate your children and to offer them all the entertainment that they need at a young age, I strongly recommend the playhouse models from Little Tikes. They positively influence the children’s minds and bodies, offering hours of good, clean fun, not to mention safety, in your very own back yard. I can say, without a doubt, that a Little Tikes playhouse will offer your children the summer days of their lives, for years. The outdoor playing equipment offered by Step 2 company is destined to keep your children safe, while offering them quality time and lots of fun, and the Step 2 playhouse is an important part of this plan. The toy manufacturer has been in the business for more than 10 years and has always focused on the importance of creative play for children, an aspect which I completely agree upon. Playhouses are a great way for your child to spend time outside, rather than in front of the computer, to breathe fresh air and be active, without getting hurt. Step 2 offers many different models of playhouses perfect for your back yard, where your kids will just love to play, especially during the warm summer days. Playhouses are easy to set up and they have a way of bringing the whole family together. Baby-sitting so many children, I noticed how important it is for a family to participate in different activities together and also how fun and constructive it is for a toddler to relate to other children. A playhouse is the perfect opportunity for all these and much more. All the playhouse models from Step 2 are suitable for both little boys and girls, and they are very easy to put together. They are made of plastic, so they do not present any dangers for the kids, and they have an open design for quick and easy access. What I love the most about all the Step 2 models is the variety of themes that the children find so attractive. The Gather and Grill playhouse for example, is perfect for children from 18 months to several years and offers them the possibility to play in the pretend kitchen or at the built in grill. The house is spacious enough for up to 5 children, and also has benches for two, where the kids can hang out, as well as a 5 piece accessory set. Another great Step 2 playhouse that I like is the Naturally Playful Front Porch playhouse, appropriate for children aged between 2 and 4. It has a beautiful porch, perfect for hot summer days or passing showers. The house has a passing through window, a fun challenge for little ones, windows with shutters and even a skylight on the roof for a bright interior. Inside, the any games they like, feeling comfortable and safe in their very own home. The playhouse can accommodate 2 children and also has a porch with a bench. The best thing, in my opinion, is that the Step 2 playhouses are fit for indoor use as well, so your children won’t have to look sadly out of the window when winter comes. As a person who spends a lot of time around kids, I can firmly state that having a playhouse for your child is a great investment. First of all, the kids benefit from social interaction, which develops their communicational skills and behavior. They exercise outdoors and, thus, they stay healthy and fit. Also, a Step 2 playhouse is great for family bonding, because all the family members can spend time and play together. One of the greatest advantages of a playhouse is its positive influence on the children’s mind, because the little ones can continually develop new games, imaginary situations and social roles that are great for their healthy development. All the playhouses manufactured by Step 2 are completely safe, so you do not have to worry about potential injuries. They come at affordable prices, some also including accessories, a great plus for the child’s entertainment. I find it hard to identify any negative aspects in these playhouses. Maybe the most visible is the fact that children eventually grow up and no longer fit inside, but, other than this, a playhouse means lots of fun. If you want to invest in your child’s future development, I strongly recommend a playhouse. Playing is one of the best ways of growing up, but only with the proper games and attention. The best way to encourage your kids’ imagination and healthy habits is to invest in a Step 2 playhouse! It is difficult to find a toy for your children that can be more enjoyable and exciting than the Little Tikes Climb and Slide castle. Designed to be used safely by smaller children, this play set will bring a lot of joy to your toddlers, while helping them explore new games, improve their climbing skills and inspire them to use their imagination and creativity. Both children and parents will be delighted to get this play set. Available at a very reasonable price, it is built to last, portable, easy to assemble and very lightweight. Also, it doesn’t take up much space, so you can easily set it up indoors even if your children’s room doesn’t have a whole lot of available space. 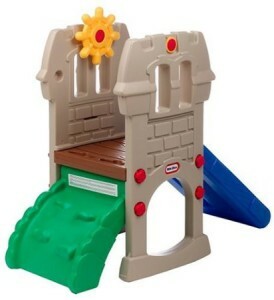 The Little Tikes Castle Playhouse is a delightful toy that any little adventurer with big dreams will love to play with. It comes with a sturdy construction and an inspiring design that will quickly become addictive for kids who enjoy making up creative new games and stories. The castle is built on top of a fun crawl through tunnel and hide out that can inspire many adventures for your little explorers. Children can use an easy rock climbing wall for beginners to get to the top of the castle tower and either play with a fun and realistic steering wheel or slide down a little slope designed to provide the gentlest landing. With the sturdy and safe design crafted by Little Tikes, your little tikes will be able to enjoy playing with their new toy for hours on end without being in any kind of danger and without being able to break anything. First of all, this is a great toy for smaller children, it can be used both indoors and outdoors, and your kids will likely have hours of entertaining fun using it. Being as light as it is, it can be kept in a small play room and taken on picnics and camping trips so your kids can have their favorite play set with them anywhere you take them. The small climber and Little Tikes slide are great both for your children’s amusement and for getting them to exercise and improve their motor skills – a very important part of a toddler’s development at such a young age. The realistic and colorful design is perfect for children who love to play out fairytale adventures and enjoy acting out make believe stories based on their favorite beautiful princesses, brave knights and powerful wizards. The material used for manufacturing this beautiful toy is safe enough to allow even the youngest children to use it without any risks of getting injured. The climbing rock wall can be somewhat difficult to handle for some children, due to the slippery plastic surface and the fact that indoors, the light weight of the Little Tikes Slide And Climb can cause it to slide away somewhat easily on smooth surfaces. 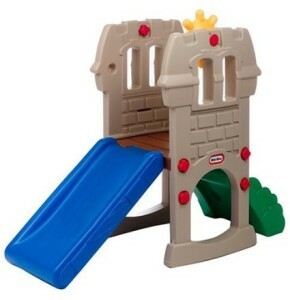 Also, if your kids are tall for their age, they might find it a little difficult to play with the Little Tikes Castle slide properly – it was designed for children between 1 and 4 years of age. I once had the privilege to babysit two beautiful children – a boy and a girl of two and three years of age – whose parents had recently bought the Little Tikes climb and slide from an online retail store. I arrived just in time to see the little girl sliding excitedly down the slope and then running back to the climber to climb the rocks again. Despite the fact that they had only been using the toy for about a day, the kids found it very easy and enjoyable to use all of its features, and we had a blast all afternoon making up games and stories to play out with the small play set. The little boy did have some trouble climbing the rocks, and his leg almost slipped a few times, but he was very persistent and, as long as I helped him up by holding his hand, we had no real issues. I was surprised at how the time passed while playing with this gorgeous play set and having fun with the kids, and we were all sad when their parents came home and “broke up the party”. At a price of only slightly above $100, this fun and engaging play set is definitely worth the expense if you want to get your toddlers a toy that they will not stop loving for months and even years to come. Because of its sturdy craftsmanship, it requires very little maintenance, and it can easily be taken indoors if a storm is coming or disassembled and placed in a car if you plan on taking your little ones on a trip to the countryside. There is nothing better than hearing the laughter of your children and watching them as they learn to explore new adventures and play with an engaging and inspiring toy. The Little Tikes Climb and Slide Castle can definitely offer them an interesting and fun challenge as they use it to have a great time, learn new skills and get a lot of good outdoor exercise. The Step2 Naturally Playful Woodland Climber is one of the most exciting toys you can buy for your toddlers that will not only provide lots of hours of fun every day, but will also assist them in learning how to use their motor skills and build up their little arm and leg muscles to become strong, confident little adventurers. The Step2 climber is very light and doesn’t take up much space, so you can place it even in a smaller play room. What’s more, you will find that it is sturdy enough to easily support 3-4 toddlers who are curious enough to explore its many different and exciting features. What Are the Most Notable Features of the Step2 Naturally Playful Woodland Climber? The Step2 Naturally Playful Woodland climber is basically a two-story structure with a 27″ tall platform that children can reach either by climbing a basic ladder or by escalating two rock walls placed on either side of the climber. It also features a fun little slope that they can slide down on safely and a rotating steering wheel that can act as a helm for their pretend “pirate ship”. The bottom compartment can also be decorated as a playhouse or a sandbox for your toddlers to play in. This adds even more to the practical value of the climber, as it can be a great asset in case you don’t have enough space in your toddler’s playroom for a playhouse or another type of large toy. Children can also use this great feature as a secluded play area, a hiding place in their pretend games or as a storage area where they can stash away their favorite toys from the prying eyes of grown-ups and older children. The realistic design features some great colors and textures, and the sturdy and resilient structure was built especially for the safety of toddlers who love to climb up and down the tall rock wall and the ladder. It is very easy both to assemble and to disassemble this Step2 climber – the whole task shouldn’t last more than a few minutes – and despite the fact that it is quite tall, the climber can easily fit in even the smallest of your rooms, being one of the most practical large toys you can buy for your children. Kids will love to play out their make believe stories in this great climber, and parents and older children can also join in on the fun. The toddlers can become pirates exploring the seven seas or brave knights who have to climb on top of the tallest “tower” to rescue a beautiful princess – there is really no limit to the imaginative play that your kids can enjoy while using their favorite toy. Aside from the many creative uses that it can offer, the Step2 Naturally Playful Climber will also offer kids a great opportunity to get all the exercise they need without having to give up their fun and games. Climbing the ladder and the rock walls will prove to be an exciting challenge that can build up both their strength and their self esteem. While this climber with slide is a great asset and a fun addition for any household, there is still room for improvement. I would suggest that you add a floor to the bottom compartment and perhaps “spice up” the climber’s top floor with a few more accessories and play items that children can have more fun with. Also, the little “room” on the bottom floor could be a bit taller. Older children or toddlers that grow faster can have a much easier time playing inside with more additional space available. One of the families I am babysitting for recently bought this Step2 Naturally Playful Woodland Climber for their 2 year old son. We had a grand time climbing “windy mountains” and sliding down exciting “valleys” with the interchangeable ladder and slide, and the little boy really loved playing inside the roomy compartments. Even though he couldn’t handle the rock walls yet, I felt confident that it wouldn’t be long before he would have a blast climbing up and down his favorite toy in every direction. This Step2 climber and slide seemed very sturdy and safe (especially the platform which is fitted with a portal that doesn’t allow toddlers to fall off), and it looked great in the child’s play room next to his many other toys – which he ignored most of the time since he was too busy with his “climb-climb toy” – and it was interesting to observe that the baby really loved the tactile sensation of the walls’ texture. This Step2 Naturally Playful Woodland Climber is definitely a good investment for an active toddler, and if your child is still too young to use some of its features, you should definitely look forward for what is to come when she grows a little older. The rock walls are extremely sturdy and have a great looking texture and design that your kids will take to in no time, and they will likely love the downstairs compartment that they can use as a hidden place to stash their little “treasures”. The Step2 Woodland climber is definitely a sturdy little piece of equipment that you can set up in minutes, even without any experience, and it will provide your kids with years of fun and entertainment while looking great in any setting – both outside and indoors. You definitely won’t regret buying it and your kids will be extremely happy with their fun new toy.